Grid-connected batteries for solar PV back-up are becoming popular through their promise of offering free evening electricity which has been generated during the day and stored for the later peak-use times. The diagram below illustrates the theory behind it. These sorts of diagrams are simplified though, and normally just show an ideal summer day. The diagram would look very different for an overcast day, or in the darker months of the year. The graph below at least shows a difference in the benefit according to the time of year, but it is still over-simplified. 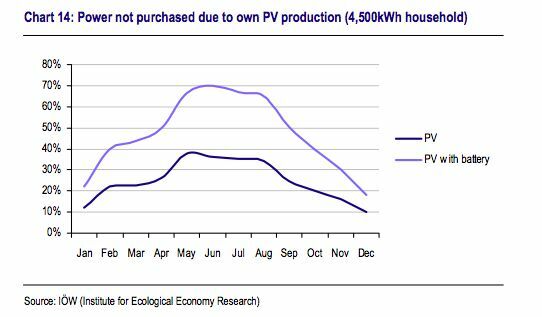 For example, a building with a 2kWp PV system, and daytime consumption which hardly drops below 1.8kW is going to make very little use of a battery as there won’t be enough surplus PV energy to charge it. Conversely, a building with a 4kWp PV system which has low daytime consumption and high evening consumption will see more benefit from batteries. The spreadsheet shown below allows user input to set some important values and hopefully show a more accurate all-round picture. Please request the editable version from us so you can play with the figures and get a better feel for how it works. 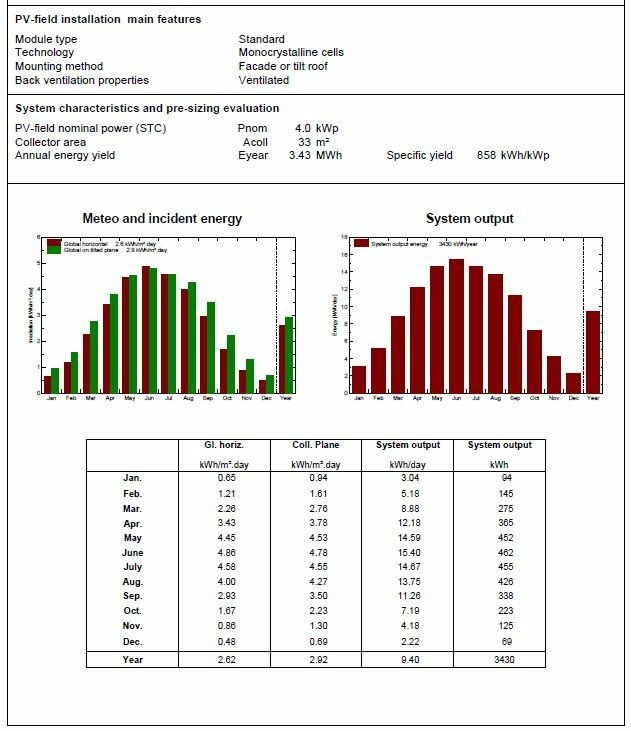 The example installation above is from a typical domestic 4kWp system generating 3430kWh per year. The PVSYST report below shows how that energy would be generated over the course of a year. This household uses 4000kWh of electricity per year, and the house is unoccupied and using less power during the day-light hours (30% daytime / 70% night-time) which is ideal for a battery system. They pay 16p / kWh for imported power. 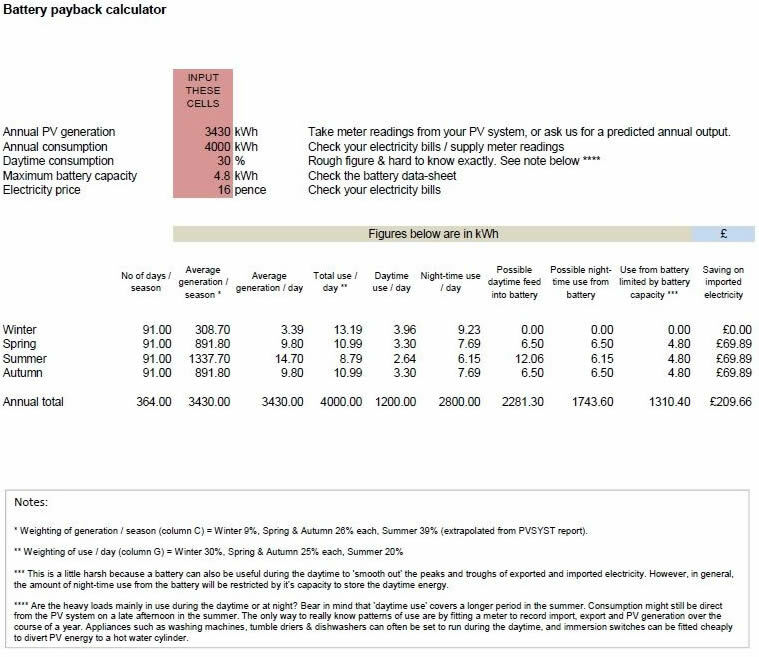 From the spreadsheet you can see that this particular system would save approx £210 / yr. Battery manufacturers now suggest a lifespan of around 10years for the modern lithium ion type. We can supply and install domestic sized grid-connect battery storage packages for around £2000 - £7000 depending on the capacity of the system. The battery back-up used in the example system above would be around £4000. VAT for domestic batteries which are installed as part of a new PV system is 5%, and where they are retro-fitted to an existing system it is 20%. There are less expensive ways, than installing batteries, of ensuring you get the most use from your PV generated electricity. The simplest is just to adapt your patterns of use so that appliances are timed to come throughout the daytime when the sun is likely to be shining, rather than in the evening. Immersion switches can be bought for £100-£200 and are designed to divert PV energy to an immersion heater only when there is excess generation.